Accordion fittings and clogged drains. One always follows the other. Countless Do-it-yourself (DIY) homeowners have fallen for the ease of installation that accordian style plumbing fittings offer. It is true that these fittings can reduce the work load and planning required when plumbing a sink or lavatory drain. In the United States building trades, a lavatory is a sink in a bathroom. It is a shortening of lavatory sink or lavatory basin. The word lavatory can mean different things to different people. In aviation, the lavatory in the word used to refer to the airplane bathroom and it is usually shortened to “lav”. In Britain, the lavatory is the porcelain throne known as the “toilet” in the US. The word, lavatory, comes from the Latin root, “lavare”, meaning to wash or bath. The medieval Latin word, “lavatorium” refers to the communal washing area in monasteries. The English words washroom and bathroom are literal translations of lavatorium. They are quite flexible and can overcome serious errors in plumbing. So I see them very often when inspecting remodeled homes. Weekend warriors will tackle a bathroom remodel and not bother with expensive plumbers. The new bathroom vanity creates the situation where the old drain P-trap does not line up with the new lavatory drain. Out comes the accordian fitting to solve the alignment issue and a clog is born. The accordian fittings are named thusly because they have of a flexible “accordian” section in the middle of the pipe. This section creates ideal conditions for trapping debris and, once trapped, this debris promotes organic growth and further trapped debris. The result is a clog in short order. Avoid this on your remodel projects. 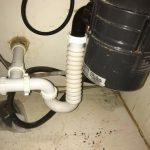 If you aren’t comfortable starting from the wall exit of the drain, call a plumber if your new lavatory doesn’t line up with the old plumbing. If you are comfortable with PVC plumbing, don’t be lazy or cheap and take the shortcut of accordian fittings. If you are staying in the house, you will be facing a series of clogs if the sink is used regularly. If you are remodeling to sell the house, any inspector worth the name will call out these fittings. Worse, using this style of fitting screams “DIY Handyman” and will put the inspector on guard and make him extra suspicious. What else in this house was shortcut?